Welcome to the house that fame built. Hip, modern, decidedly dramatic, and the centerpiece of the Las Vegas Strip, Planet Hollywood Resort & Casino is more than the newest hotel in town. It's the shopping, dining and gambling destination of choice for the city that celebrates celebrity. 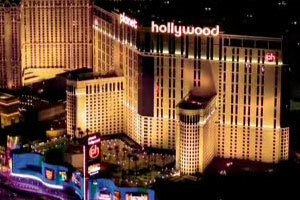 Planet Hollywood Resort & Casino has all the action you can handle with three acres of gaming, a variety of tables and slots, a huge poker room, The Playing Field race and sports book, and the scintillating Pleasure Pit, with beautiful women dealing blackjack, clad in sensual lingerie, while go-go dancers cavort overhead. You can dine at one of eight extraordinary and already famous restaurants, including Koi from Los Angeles and Strip House from New York. Catch "Peepshow" in our 1,500-seat Showroom. Splurge at Miracle Mile Shops with 170 stores and boutiques. Rejuvenate at the Planet Hollywood Spa by Mandara. And luxuriate in one of our 2,500 plush and stylish rooms and suites - each one with its own piece of Hollywood history - actual memorabilia from famous films.